Assembling in Berkeley, California in 2014, Crooked Flower has proven to be a worthwhile independent recording artist with three albums under their belt and a new one on its way. 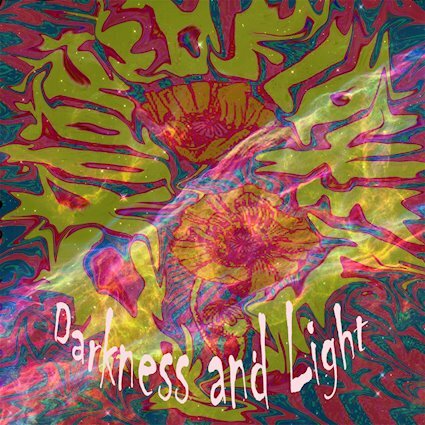 The band’s new EP Darkness and Light is a way to release more music between studio albums. CF mix elements of rock, funk, and psychedelic with strong R&B vocals that’s very pleasing to the ear. Coming in at a whopping 11 minutes and 50 seconds, “Bells of Brixton” is one helluva way to kick off an EP, which are generally about the same running time for 4 or 5 songs in total. Crooked Flower shows their ambitions by trying to get your attention as a listener with a big and operatic opening that’s simply too big to ignore. The track is robust with a clear inspiration to Jeff Buckley and The Cure with a healthy dose of 311 and Grateful Dead, as a jam band with elements of funk in a well-structured arrangement of music with layers on top of layers. It’s tough to follow up a track like “Bells of Brixton,” but “Tunnel of Light” adds something the opener didn’t have, vocals. The song features Angelina Dang, who has a soulful voice that’s perfectly suitable for Crooked Flower. It has a wonderful driving and kick with smart arrangements and clean production value. “Moving On” is spellbinding with sharp guitar work from Dan Ingberman, who compliments Dang’s smooth as silk vocal stylings, while the release is finished off with “Boyfriend,” a mellow track that has hints of math rock structures with soft and bubbly tones as it builds to a fitting way to end Darkness and Light. Overall, the EP is a strong release with electric elements that seem perfect for each other. You remove one of them and it appears to all fall apart, so it’s a good thing the members of Crooked Flower work so well together. For more information, check out Crooked Flower’s website and Facebook page. After training a pack of Raptors on Isla Nublar, Owen Grady changed his name and decided to take a job as an entertainment writer. Now armed with a computer and the internet, Grady Owen is prepared to deliver the best coverage in movies, TV, and music for you.